Centre for Science and Environment (CSE) India organised a day long workshop on conservation of waterbodies in Sri Lanka on June 11, 2013. The workshop was attended by researchers, activists, city planners, advocates and regulators from Sri Lanka including Dinesh Gunawardane, Hon’ble Minister of Water Supply and Drainage. The meeting was an initiative to influence the policy debate on conservation of waterbodies in South Asia and to push policies that encourage participatory and locale-specific systems for their conservation. The objective of the workshop is to set up a network of researchers, NGOs, legal advocates and regulators from Sri Lanka and India involved in the conservation of waterbodies. The workshop was a part of an exercise to understand the issues/threats to waterbodies in South Asia and the legal mechanisms/aid available for their protection. More than seventy people participated in the workshop and shared their views and opinions on conservation of water bodies in Sri Lanka. Nitya Jacob and Sushmita Sengupta from CSE presented the Indian scenario of protection and conservation of water bodies. D.S.D. Jayasiriwardane, Additional General Manager, National Water Supply and drainage board highlighted the dependence of drinking water on the waterbodies of Sri Lanka. Engr. Janaki Meegastenna, Department Of Irrigation, discussed the importance of waterbodies as the source of water for irrigation in Sri Lanka. Kamy Melvani, Managing Director, Neosynthesis Research Centre talked on cleaning up technologies applied in cleaning of waterbodies in Sri Lanka. 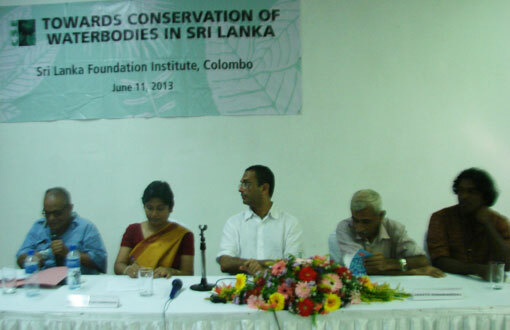 Nalaka Gunawardene, a science writer and columnist spoke on the role of media for conservation of waterbodies. Dr. Ranjana U.K. Piyadasa from University of Colombo shared some success stories for conservation initiatives of waterbodies of Sri Lanka. Hemantha Jayasundara from Institute of Town Planners discussed the planning for water sensitive designs for upcoming cities and towns of Sri Lanka. W. Wijesinghe of Sri Lanka Central Environmental Authority made a presentation on water quality in different waterbodies. Prof. P.K.S. Mahanama from university of Moratuwa and Hemantha Withanage founder of Centre for Environmental Justice highlighted the existing laws and policies for conservation of waterbodies and the court cases on saving the waterbodies of Sri Lanka respectively. Dr. C. Panabokke, one of the prominent soil and water expert of Sri Lanka also participated in workshop as a panelist along with Raveendra Kariyawasam, an activist, Dhammika Wijayasinhghe, Sri Lanka National Commission for UNESCO and Advocate Jagath Gunawardena. Tanuja Ariyananda, Director of Lanka Rainwater Harvesting Forum and Dr. Saranga Alahapperuma, Director, Central Environmental Authority chaired the sessions focused on conservation measures and revival of waterbodies and laws and policies for the protection of water bodies in Sri Lanka. It was found that the issues and threats to water bodies are common to both Sri Lanka and India. There was no dearth of law for the protection of wetland or waterbody in the island country yet, the country is failing to preserve its water wealth. Strengthening of the implementation of the regulation is the need of the hour.